Yes. I did from the moment after physically receiving smicha. There was an expansiveness in my chest, around my solar plexus. This sensation lasted for several days. It was very odd, but it really made me realize that something had truly changed from the inside out. It was notably different than what I experienced with the Becoming ordination. That was from the outside in. I’m not sure I could have put those words to it then, but now I can. My Becoming ordination was my spiritual community stating that I was seen as a spiritual leader and a holder of the community’s heart. Each member of that community, and a few others, publically gave me their blessing as part of the ritual. What changed was my relationship to the community and theirs to me. It was a change from the outside in. And from this moment on, you are a Kohenent. That’s when something changed inside of me. What that means, I don’t really know yet. I wish I knew. 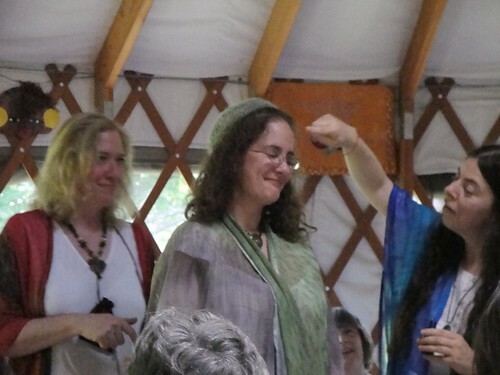 The smicha ceremony was on Shabbat. Sunday, I flew home. Monday, I slept. Tuesday, I went back to my corporate “day job.” Would I like to give up the day job? Of course, but I haven’t figured out how to earn a solid income without it, yet. Truth is, I do a lot of priestessing there. It’s not what they think they pay me for, but it’s needed and wanted, nonetheless. Return to teaching this year, after a three year break during the Kohenet training. Leading a Rosh Hashanah service again this year — and that several Kohanot will be journeying to DC to be a part of it! Get more involved, somehow, with the Jewish community — without giving up Becoming. That’s a sacrifice I’m not yet prepared to make. Do more with DC Harvest and see where that can take me. I’ve had a couple of HUGE breakthroughs as an artist in the last few months, so I’d like to continue with my artwork and see how far I can push myself creatively. Continue the Wheel of the Year guides and maybe trying to compile them into a book along with the seasonal haggadot. That’s a pretty big list, considering I have a demanding day job! That list doesn’t even include things like “keep employed” and enjoy my husband’s company, visit with family and friends, providing priestessing ritual/rite of passage services, and everything else. If you read all of this and would like to see more pictures of the final week of Kohenet and the Smicha Ceremony, there’s plenty on Flickr. I’d love to hear your thoughts on all this and any suggestions for what’s next! Mazal tov to your on your smicha, and thanks for sharing these thoughts on how it felt and continues to feel. Sometimes we must experience other to understand what has been before. Mazel tov! May you continue to grow from strength to strength and experience hatzlacha v'simcha in all that you do!! Just the photos, and they are beautiful! You look positively euphoric! Mazel tov yet once again! I am very happy for you! Thanks for trying to articulate this most personal experience! I'll be particularly interested to hear how *you* walk the line between your two worlds as time goes on. Mazel tov! Have you posted time/place info for Rosh Hashanah yet? I would love to attend this year.